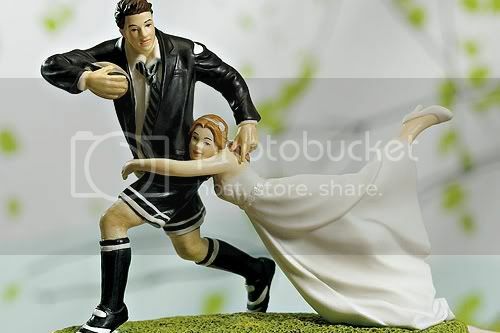 Hey brides: can’t you just picture this little rugby man cake topper sitting atop your classic, white fondant wedding cake? Hmm…probably not. But you know who can? Your groom! But have you even really considered him in all the planning? Or better yet, have you ever considered a wedding all about him? From fun yet classy cake toppers to sports-inspired guest favors, there are so many options to help you make your wedding day fit for a man, with style! No matter what his sport of choice may be, Weddingstar has everything you need to make his dream wedding a reality! So he’s the type who prefers to spend three hours at the driving range than take 10 minutes to try on his tux? Well then a golf-themed wedding sounds like something he’s sure to get involved in! The golf fanatic and exasperated bride make the perfect cake topper pair, and will add just the right amount of humor to your big day reception. Get your guests in the mood to hit the green with golf-inspired wedding invitations from our Golf stationery collection. The smart, preppy design comes in five different colors. Give your man a golf-inspired groom’s gift he’ll be happy to receive. The 5-piece golf bag BBQ tool set is so charming and functional! Whether it’s baseball, basketball, football, soccer or all of the above that he’s into, get him the perfect sporty cake topper to fit his style! These are so fun, so playful and yet so classy all at the same time. Take your pick between the bride and groom baseball cake toppers, the football couple cake topper or the #1 fan bride and soccer fanatic groom cake toppers. All are full of life and will make a great mantelpiece memento long after the wedding. These adorable football (with sticker), soccer (with sticker), basketball (with sticker) and baseball (with sticker) mini gumball machines are so charming as guest favors, and the stickers are customizable and come in a range of colors. If it’s speed your man is after, then why not give him the racing-themed wedding you know he’ll love? Make your cake a sure winner with the victorious groom and bride cake toppers or adorable get-a-way car figurine. Give out the car wheel pen set as guest favors or as gifts to your groom’s racing-buddy groomsmen. Skier, gym rat or extreme sports fan — we’ve got him covered! The skiing couple cake topper will really capture the jock-like nature of his personality without being too in-your-face with the sports theme. The bride and groom Frisbee is an absolute crowd-pleaser! It makes great guest favors and will entertain even the most rambunctious bunch during the wait between the ceremony and reception. And the engravable stainless steel yo-yo will make a great gift for your ring bearer, flower girl or any other yo-yo fan in your wedding party. OK so maybe your groom’s always dreamed of making it big but just never got there, well why not celebrate his other love anyway with these sports-esque wedding decor ideas. The “couch potato” groom cake topper, novelty popcorn cartons with the customizable love sticker and fun drink tickets that look like tickets to a sporting event are just a few unique sporty elements to include in your wedding. But if you still can’t fathom ever letting your groom’s love of sports take over your special day, you can always opt for getting him a groom’s cake instead. It at least gives him one element of the wedding he can call his own. Whether he helps you with the planning or not, be sure to incorporate his likes and interests into the wedding as well. After all, it’s his special day too. Have a fabulous weekend and happy weddings!